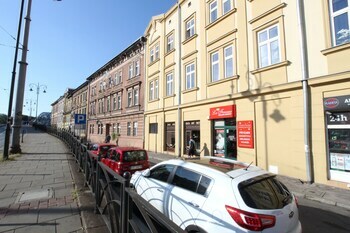 A stay at Rainbow Apartments 3 places you in the heart of Krakow, within a 15-minute walk of Galicia Jewish Museum and Old Synagogue. Featured amenities include express check-out and multilingual staff. A shuttle from the airport to the hotel is complimentary (available on request), and a train station pick-up service is also provided at no charge. With a stay at Apartinfo Apartments - Blue Side Family in Gdansk (Brzezno), you'll be within a 15-minute drive of PGE Arena Gdansk and Brzezno Pier. Located in Koscielisko, Willa Przy Dolinie Kościeliskiej is within a 5-minute drive of Kościeliska Valley and Tatra National Park Poland. Free self parking is available onsite.